It’s all about playing live, most musicians will tell you. Not being stuck in your room practising your chords, not being confined to a garage sinking beers and playing covers, not being holed up in a studio for months in pursuit of aural perfection. These things are necessary stages in the evolution of most bands worth their salt but it is the release of playing live that is the purpose of being a musician. Of course the larger the crowd the greater the release but even if you are a small band starting out you can still think big and renting your sound system allows you to live big too. As the music industry undergoes vast inexorable change, more and more bands and musicians at all levels are opting for the DIY method of getting things done. For bands and artists just beginning there are an increasing number of small recording studios which offer the full deal of recording, manufacturing and packaging of CDs, for those who still buy them. This DIY philosophy can also be applied to playing live. Hiring a good sound system and technician will save you a lot of money and potential grief and put you on the right road as well as in the right mind set. Why not launch your band in style by playing your first gig in the backyard of your house using a rented PA system? You could get a BBQ going to really make the occasion memorable. Or you might want to play in your favourite pub for free pints! No sound system or stage? The solution is simple: rent them both! You might be more ambitious and want to play a gig in the assembly hall of your old school or maybe in the cafeteria of your college on fresher’s day or in a community hall in a small town – anywhere that wouldn’t keep a PA system. The same thing applies: think big. Hire it. Record Your Gig Live With Modern Sound System Rental Gear! Most modern rental sound systems come with a mixing desk which allows the operator to record the gig. As technology has improved, live material has gotten better and better to the point where these days you can make a live album with a fairly modest set up. Gone are the days of the bootleg. For playing and recording live it is highly recommended that you rent an AV technician as well to oversee everything. As the size of the gig grows the more necessary it is to hire one of these guys to keep you sounding good. An AV technician will get you the right equipment for the job and will look after it on the night so you can concentrate on doing what you do best. 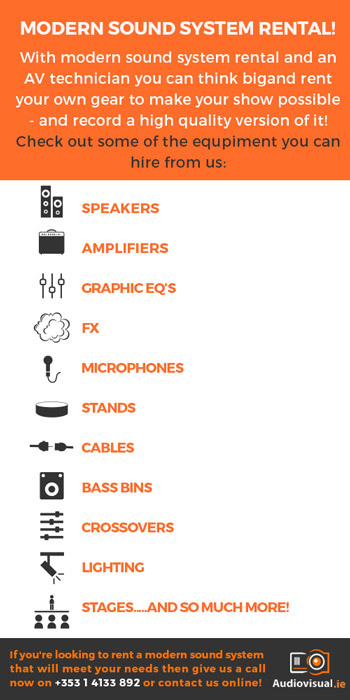 You can hire speakers, Amplifiers, Graphic EQ’s, FX, Microphones, stands, cables, bass bins, crossovers, lighting and so much more. So the ethos of most bands starting out these days is to think big, think DIY. Some of these bands will go on and make it to the big time. Rock n Roll and philosophy generally don’t mix but we might say that thinking big proves Plato’s theory that we become who we wish to be. So give yourself a chance and, even if it’s just for the proverbial 15 minutes, be who you want to be. After all, as the song says, you’ve got to make it happen. If you’re in a band and looking to think big or just need a sound system for an upcoming event or show then give us call now on +353 1 4133 892 or contact us online and we’ll be able to sort you out with all the rental equipment you need!